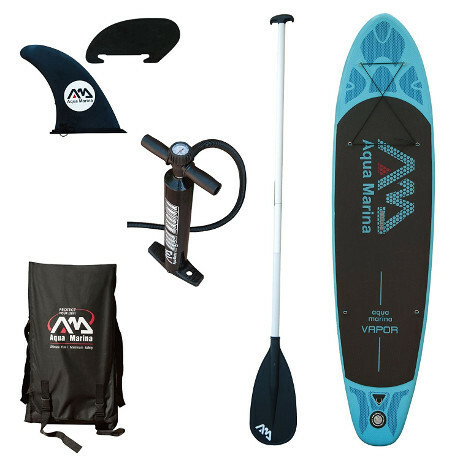 Aqua Marina is perhaps the closest thing to an OG in the industry of inflatable paddle boards. Indeed, the brand at hand is one which is almost synonymous with inflatable paddle boards because they have almost existed simultaneously and that can already tell you a lot about this manufacturer. 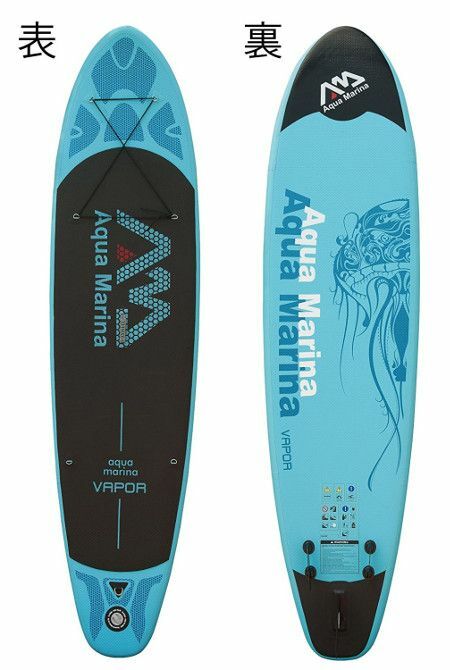 Hence, Aqua Marina has managed to build a solid reputation through the years as one of the best iSUP makers out there and that’s because of boards like the Vapor. The Vapor is pretty much the embodiment of the principles of Aqua Marina because it stands for quality, practicality and compatibility. So, let’s take an up close look at this board and determine whether it’s the right board for your or not. Obviously, measurements should be your primary concern here because it can either make or break the deal for you. Depending on the size of the board, you’ll be able to figure out how appropriate it is for your needs and requirement or perhaps the opposite. Accordingly, the Vapor stands at a universal 10 feet 8 inches in length and the reason it is universal is because this board is actually a perfect fit for grown teenagers, young adults and adults alike. Indeed, the Vapor’s length is one of its golden specs not only because it makes it so versatile but also because it’s going to significantly impact its performance. Speaking of which, a board’s stability strongly depends on its width which is why the Vapor comes at a comforting 30 inches. At this exact width, your last concern would be trying to keep your balance on top of the board because it’ll be stable enough even for complete beginners. Also, with a platform this wide, you are granted enough freedom to actually move around and adjust yourself comfortably onboard to achieve efficient command without risking falling off. The least that can be said about the length and width of the Vapor is exemplary. However, thickness comes in a little short at a shy 4 inches. Don’t get me wrong, it is not unforgivable but 4 inches in thickness is not very promising either. Nonetheless, the board at hand is still pretty strong and as long as you respect the weight limit, the hull should be in perfect condition. PS: the weight limit on the Vapor is said to be a little over 220 pounds but our advice is to regularly keep it within that limit. Quality is one of the things which made Aqua Marina what it is today. For a leader in the industry, the least you’d expect is premium quality products and Aqua Marina delivers. Indeed, the boards made by these guys often exhibit world class quality which is pretty evident in the Vapor. Accordingly, the Vapor is made out of the toughest most flexible material that can still float. Multiple layers of military grade PVC has been proven to be pretty robust since it is the same stuff that zodiac boats, river rafts, and some bulletproof vests are made of. So, you can only imagine how resilient this board is going to be when confronted by your day to day obstacles. Moreover, the board at hand is even further enhanced via an industrial drop stitch construction which is the brand’s signature and reassurance that the hull will stick together indefinitely which cannot be said about most inflatable paddle boards out there. Features are a common attraction for paddlers who are looking for a practical board that can perform the task of a hard board with a little more accessibility and efficiency especially for beginners. Accordingly, the Vapor is here to set an example of what every inflatable paddle board needs. The most prominent feature on the Vapor has got to be the EVA gripping pad which is beautifully designed to cover almost the entirety of the board’s platform and slide to the edges to grant you more freedom and ability to move around comfortably. This pad will not only improve your balance but it’ll also grant you a better command over the board. The upcoming feature of this Aqua Marina is the 4 D-rings on the nose which are connected via a bungee cord, making a solid cargo net that will come in extremely handy. The net can be used to transport or secure anything from your sandals to your paddle and it will be often used. Moreover, the Vapor features a couple more rings near the tail which are meant to help you attach a kayak seat and an extra ring on the tail for hooking up an ankle leash. The next important feature on the Vapor has got to be the central carry handle. As small as this little feature is, it is still indispensable for paddlers who often go out paddling. The handle will enable you to carry your board individually on land which is pretty much impossible to achieve without it. Keeping in mind that this is an entry level board, the Vapor is actually not a bad performer. In fact, taking into consideration that this board was designed with a beginner in mind is rather surprising because it exhibits a lot of the traits often found in competitive boards. Accordingly, the Vapor focuses more on creating a balanced platform for the paddler than racing him or her to the finish line but it can still be pretty swift thanks to its low resistance hull shape, its smooth edges, lifting nose wide tail and triple fin track efficient navigation system. The Vilano Vapor iSUP comes in complete all-inclusive package. It’s a great entry-level recreational paddle board. 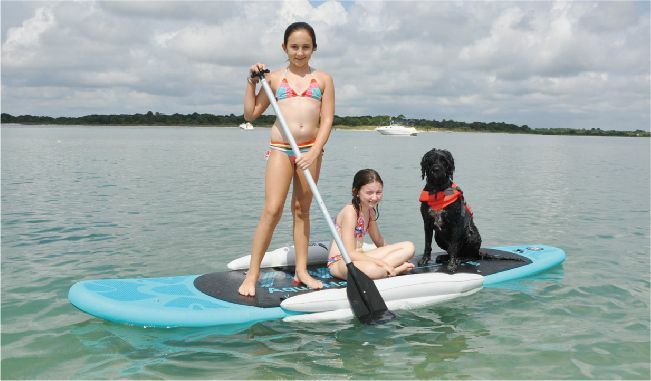 It’s a budget-friendly inflatable paddle board. The board is only 4″ inches thick.